NASA recently kicked off NAAMES, a five-year study of what’s happening at the bottom of the ocean food chain and how that will evolve as climate changes. NAAMES includes ocean, airborne and satellite components. This video features scenes from in and around St. John’s, Newfoundland, which is where NASA’s C-130H Hercules airborne laboratory began the first of what will ultimately be four field campaigns. Also included is footage from aboard the C-130 as it flew over the North Atlantic, which is where the study is being conducted. Plankton: They’re the tiniest of sea creatures, the bottom of the ocean’s food chain. But when those pee-wees of the sea multiply in what’s known as a bloom, they can, collectively, have an enormous and far-reaching impact on the planet. NASA’s C-130H Hercules airborne laboratory spins down it’s engines in St. John’s, Newfoundland, after a 10-hour flight over the North Atlantic. That’s why another collective — of humans, specifically researchers and scientists from NASA and academia — have taken a distinct interest in the diminutive organisms. In fact, the folks from NASA and academia are so interested in plankton that they recently launched something called the North Atlantic Aerosols and Marine Ecosystems Study, or NAAMES, an intensive, five-year investigation of what’s happening at the bottom of the food chain and how that will evolve as climate changes. half the carbon dioxide emitted into Earth’s atmosphere every year ends up in the ocean. Plankton absorb a lot of it. The thing that makes the North Atlantic plankton bloom so special and so ripe for study is that it’s the largest bloom in the world — a veritable „plankton pageant,“ according to Behrenfeld. 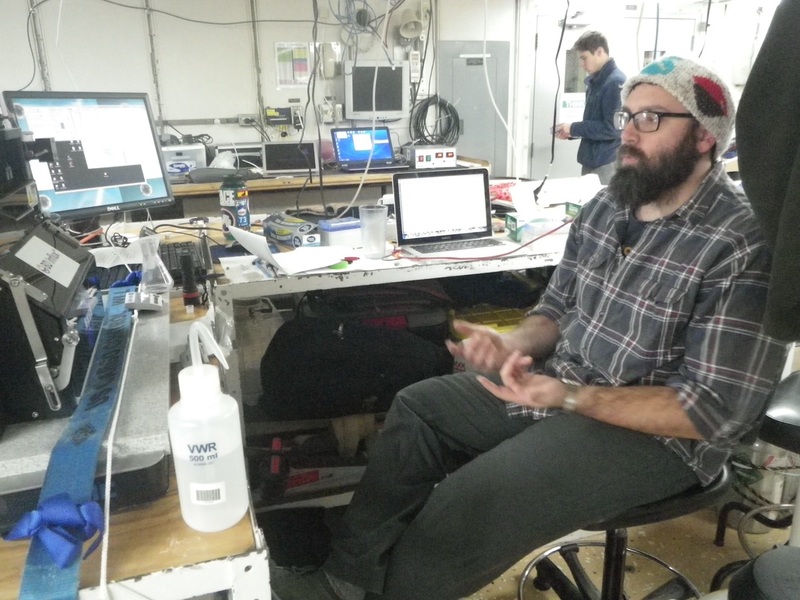 Jason Graff, a scientist aboard the Atlantis, works on an instrument called a flow cytometer. There’s some controversy, though, over when that pageant begins. It was traditionally thought to kick off in the spring, but recent satellite data may point toward an autumn origin. Behrenfeld and his fellow scientists hope to discover the true answer. But this study is about more than just understanding what that plankton pageant is doing underwater. „NAAMES is also a study investigating how these plankton populations give rise to small organic particles that leave the ocean and get injected into the atmosphere to ultimately influence the clouds and climate,“ Behrenfeld said. When those organic particles leave the ocean, they do so as aerosols, some of which can be detected in the wind as far away as Ireland. NAAMES project pilots John Long (left seat) and Jeff Chandler (right seat) man the C-130 controls while flight engineer Jerry Lewis inspects the overhead indicators. So if NAAMES sounds like a complex study with a lot of different facets, that’s because it is. During the field campaigns — four total, about a month each, all scheduled to coincide with critical phases of the bloom — researchers will take measurements by sea and by air. Satellite data will fill in the gaps between campaigns and help provide a big-picture view. 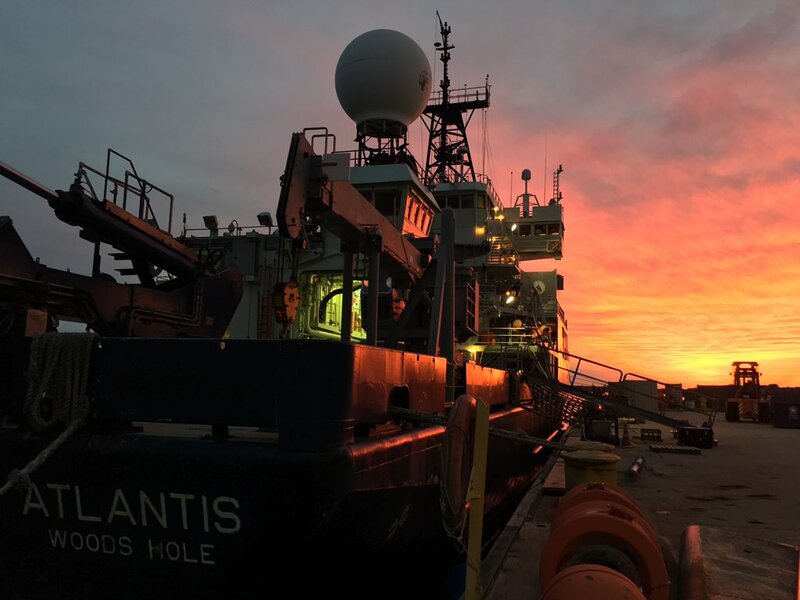 NAAMES kicked off Nov. 6 when the research vessel (R/V) Atlantis, which is operated by the Woods Hole Oceanographic Institution, left Woods Hole, Massachusetts, for the first of the four campaigns. The Atlantis is carrying a wide range of instruments that will help Behrenfeld and his ocean-going team measure everything from the types of organisms present in the bloom, to the rates of plankton growth and photosynthesis, to the relationships between predators and prey. 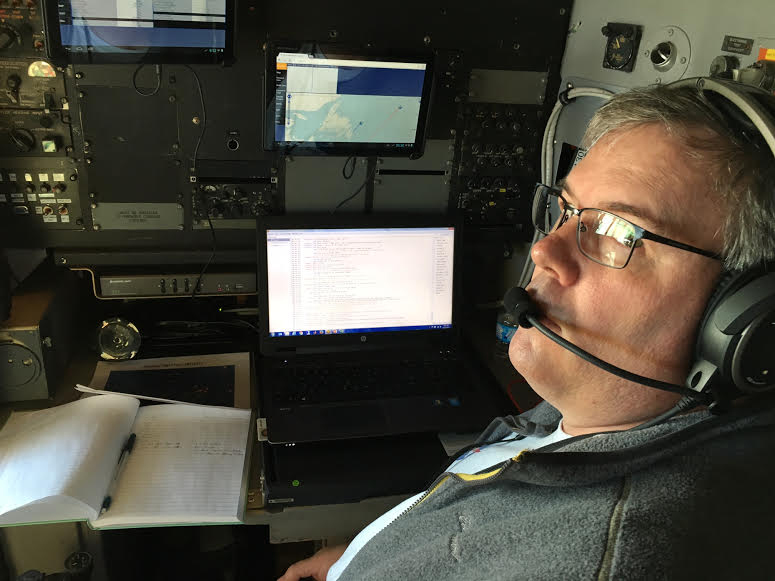 NAAMES flight director and lidar scientist John Hair sits in the C-130 cockpit station and communicates directly with the pilots, the investigators in the back of the plane and the team at St. John’s. 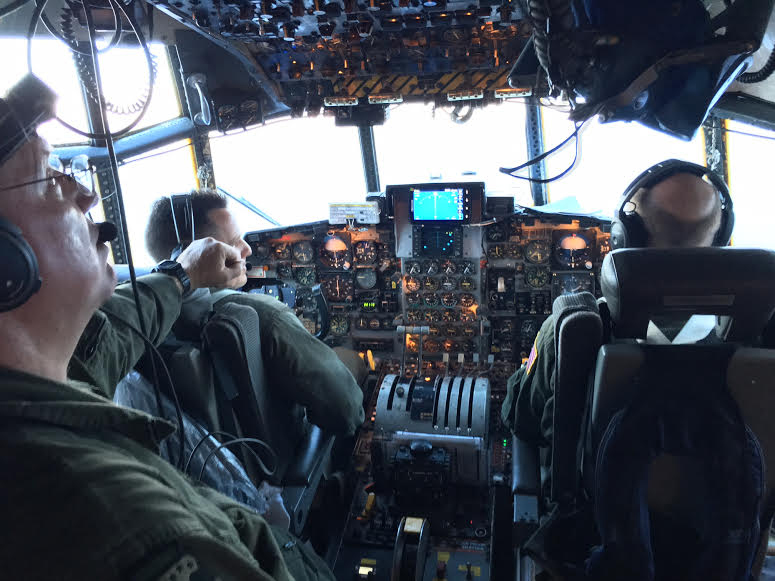 NASA’s C-130H Hercules airborne laboratory, based out of Wallops Flight Facility, will complement the Atlantis’s research by collecting airborne data. 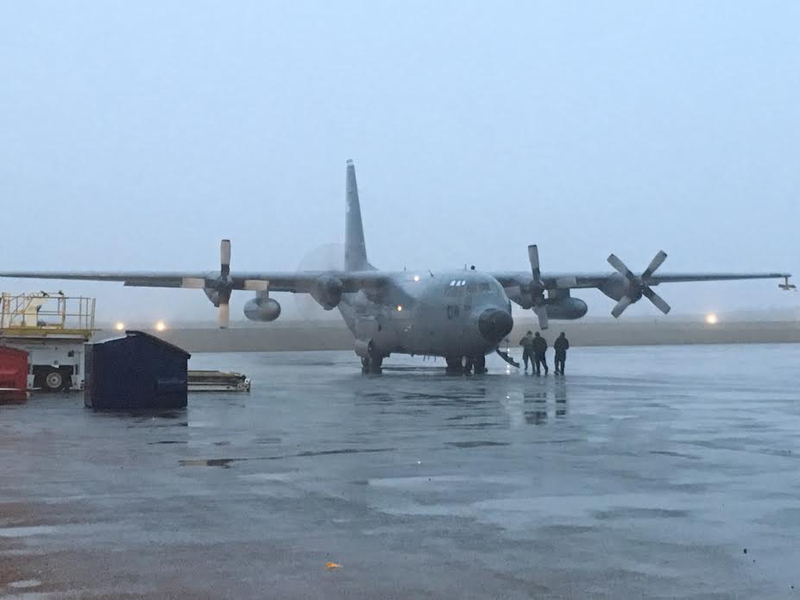 Research flights, which are being coordinated with the movements of the Atlantis, began Nov. 12 out of St. John’s, Newfoundland. The research vessel Atlantis sits at the dock in Woods Hole, Massachusetts. The C-130 is carrying instruments like the Langley Aerosol Research Group (LARGE) suite of instruments and the High Spectral Resolution Lidar (HSRL) that is also from NASA Langley. The NASA Goddard ocean color sensor (GCAS), the GISS Research Scanning Polarimeter (RSP) and the PTR mass spectrometer round out the mix. The airborne researchers will use these instruments to characterize the oceanic and atmospheric properties of the North Atlantic region during each of the deployments and link the Atlantis’s detailed ocean biology measurements to those relevant for current and next-generation satellite instruments. The whole operation is a bit like an intense, intricate dance, which Moore finds invigorating. NAAMES is part of NASA’s second series of Earth Venture suborbital investigations recommended by the National Research Council in 2007. Earth Venture investigations are part of NASA’s Earth System Science Pathfinder (ESSP) Program managed at Langley for NASA’s Science Mission Directorate in Washington. The entire endeavor has been a labor of love for Behrenfeld, who sees great potential for discovery. So yes, Behrenfeld is, in a sense, turning to the bottom of the food chain to feed his own passion for discovery, but he hopes there will be significant ramifications for the world at large. For more information and updates on the study, visit the NAAMES website. OSU’s Michael Behrenfeld leads a major study on plankton bloom behavior. Photo by Gail Wells. CORVALLIS, Ore. – A new study at Oregon State University could overturn conventional wisdom about the role of phytoplankton in the Earth’s carbon cycle, potentially changing scientists’ understanding of how global warming will alter the environment for marine life. OSU researcher Michael Behrenfeld, an expert in marine plants, is leading a $30 million NASA-funded study of a phytoplankton “hot spot” in a triangle of ocean stretching from Woods Hole, Massachusetts to the Azores and north to Greenland’s southern tip. Behrenfeld’s team will gather shipboard and in-ocean data from four sea cruises over the course of the five-year study. The two spring cruises will catch the North Atlantic plankton bloom – one of the biggest on the planet – in its most southerly latitude and follow it as it progresses north with the warming weather. Simultaneously, aircraft will fly near the ship and take measurements of tiny airborne particles called aerosols, which are linked to plankton activity and which also play a big role in the Earth’s energy cycle. Phytoplankton – which are an assortment of single-celled plants dwelling in the ocean’s upper layer – are the foundation of the marine food web. As they capture sunlight and turn it into sugar, they become food for zooplankton (the animal variety of plankton), which are eaten in turn by other organisms, and so on up the chain. Phytoplankton are present throughout the world’s oceans and are most abundant in the high latitudes of the northern and southern hemispheres. In these cold, nutrient-rich waters, they typically undergo seasonal population explosions, or blooms. For decades, scientists have attributed these blooms to springtime increases in sunlight and warming temperatures – much the same seasonal pattern that makes gardens bloom on land. This explanation is based on a limited number of measurements from ships in the early 20th century. Under this traditional scenario, warmer oceans should produce bigger blooms, which should produce more food for ocean-dwelling life. Yet satellite images suggest a different story, Behrenfeld said. Sophisticated instruments continuously monitor global plankton populations year-round by measuring shifts in light-wave frequencies that capture changes in phytoplankton abundance. Studying these images a few years ago, Behrenfeld noticed phytoplankton blooming when they shouldn’t have been. Behrenfeld proposes a different explanation: The blooms are born in early winter, when the ocean’s upper waters – the so-called mixed layer – are agitated by strong winds. They also are churned by a process called thermal convection, in which the top tier of water gets cold and sinks, causing the warmer waters beneath to well up to the surface. These physical forces cause a deepening of the mixed layer, and this, Behrenfeld believes, gives the phytoplankton room to spread out, making it easier for them to escape being eaten by zooplankton. He hypothesizes that the phytoplankton take advantage of their competitive edge to out-multiply their grazers and begin a population increase that culminates in a spring bloom. If the winter turbulence of the ocean is what triggers a plankton bloom, as Behrenfeld believes, and not spring warming, then a warming ocean should produce smaller blooms, reducing photosynthesis and potentially limiting the ocean’s food supply. The new study will provide the measurements needed to test this hypothesis and compare it to the traditional explanation. The NASA team includes four other researchers from OSU’s College of Agricultural Sciences (Stephen Giovannoni, Kimberly Halsey, Allen Milligan and Toby Westberry) and scientists from NASA, the Woods Hole Oceanographic Institute and six other U.S. universities. Almost $4 million of the grant funds will go to the OSU team.